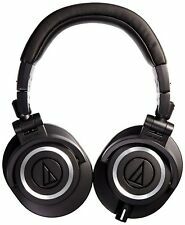 Audio-Technica ATH-ES10 EarSuit Dynamic Closed Back Headphones Japan new. 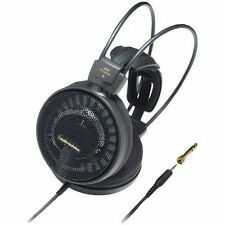 These Audio-Technica ATH-M50x Over the Ear Headphones - Black In Color are in good physical and working condition. 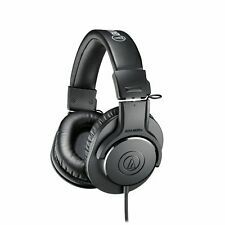 Audio-Technica ATH-M50x Over the ear headphones - Black in color. They outputted crisp clear sound. 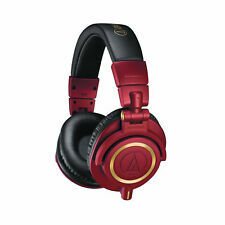 Audio Technica ATH-M50 Monitor Headphones - Red. Well taken care of, hardly used headphones. Does not come in original packaging. If you have any questions let me know I ship quickly, thanks for your interest! Bluetooth Wireless Headphones. NEW Audio-Technica ATH-M50xBT. are not included in the Buy It Now price and will be calculated at checkout. Professional Studio Headphones. Includes black ATH-M50x headphones, 4' to 10' long coiled cable, 10' long straight cable. 4' long straight cable for use with portable devices. 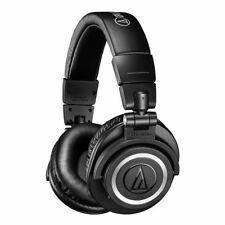 NEW Audio-Technica ATH-M50x Black. 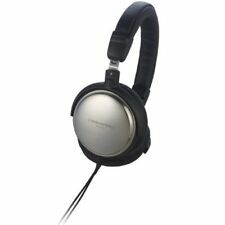 Audio-Technica ATH-ANC27 Noise Cancelling Headphones - Black . Condition is Used. Shipped with USPS Priority Mail. Audio-Technica ATH-M50x Over the Ear Headphones - White Condition is Used. Also comes with both shorter and longer cables. Shipped with USPS Priority Mail. Exclusive pure digital drive system. Photo & Video. MFG Part #: ATHDSR7BT. Compatible with Qualcomm apt HD, apt, AAC and SBC Codecs. How long does it generally take to process an order?. The manufacturer will generally repair or replace the item so long as it is under warranty. AudioTechnica ATH-AX1iS SonicFuel Over-Ear Headphones The ATH-AX1iS over-ear headphones feature 36 mm drivers for optimal sound generously cushioned ear pads for comfort during extended wear and a fold-flat design that allows for easy storage. And with super soft velour earpads, you’ll stay comfortable no matter how long you play. Audio-Technica Premium Gaming Headset. Detachable smartphone cable with inline mic. Cable: Three detachable cables: 1.2 m (3.94') boom mic cable, 1.2 m (3.94') smartphone cable and 2.0 m (6.6') extension cable. The Audio-Technica SonicFuel Hybrid Earbuds are perfect for those who love the convenience of earbuds, but hate the feeling. That's because these earbuds are uniquely designed to nestle in the ear without actually entering your ear canal. This is a used item and will have signs of use. Deep, major, detailed cleaning is NOT done unless noted above. We do not know the full history of each item. Trending at $27.65eBay determines this price through a machine learned model of the product's sale prices within the last 90 days. The ATH-M2X is a supra-aural, open back dynamic headphone that features high performance drivers and low-mass diaphragms. 11.5' cable with 3.5 mm stereo mini-plug. A valid phone number is required for all orders. This item also includes a carrying pouch but does not include other accessories. The ear covers are lightly scratched, the headband and ear pads have minor creasing but no signs of tears or holes. The headphones have been tested and are in overall good working condition and ready for use. Bought this new 6 months ago. Perfect condition. 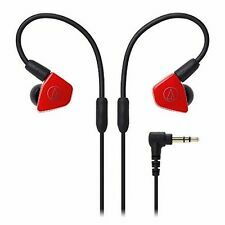 (AudioTechnica ATH-WS660BT Solid Bass Wireless Over-Ear Headphones with Built-In Microphone and Remote (Red/Black). 9') cable allowing you to use the headphones in areas where wireless operation is prohibited (e.g. in airplanes or hospitals) or when battery power is low. Condition is Used in new condition. 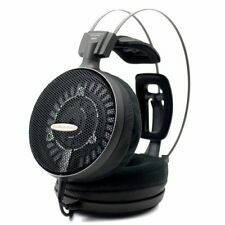 Audio-Technica ATH-M50xGM Headphones, Gun Metal with Bluetooth Adapter. Used for several months. Comes with original box, carrying case, and East Brooklyn Labs Bluetooth Adapter. Format: HEADPHONES, Black,ON-EAR Headphones,Bluetooth. Communication System: Bluetooth Version 4.1. Output: Bluetooth Specification Power Class 2. Compatible Bluetooth Profiles: A2DP, AVRCP, HFP, HSP. Those may Not be included, only what is listed is included, and Nothing else. Audio-Technica ATH-W100. Condition is Used. Shipped with USPS Priority Mail. Sounds great.. The ear pads are replaced new pads. No blemishes on the wood surfaces. The headphones also work when the noise-cancelling function is turned off, and operate in passive mode without batteries. Fits securely and directs music into your ears for full, uninterrupted audio. For reference-grade audio. For faithful sound reproduction. To efficiently conduct power. 12 ohms impedance. ATH-M50 Audio Technica Over Ear Closed Back Head Phones having a greater experience blocking background noise. Sound still sounds (GREAT) for music and movies still 145$ value headphones. 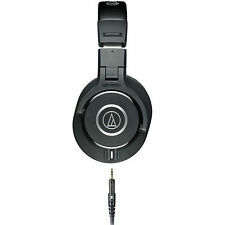 Audio-Technica - ATH M50XBT Wireless Over-the-Ear Headphones - Black. Listen to your favorite songs anywhere with these Bluetooth Audio Technica headphones. Bluetooth 5.0 interface. Enables simple wireless pairing with your Bluetooth-enabled device. Insert a USB flash drive containing MP3 files into the "correct" USB port and enjoy it. If that's not enough, you can also support your playlist with a full range of audible frequencies without distorting the original signal from your MP3, iPhone,Android Smartphones and more Bluetooth devices. Which you can see in the pictures. These are OVER EAR headphones, so they will not surround your ear. They will sit on the ear. These ARE NOT THOSE. At least as far as I know. That is not what I paid for mine. Bringing the best in high-resolution audio quality to an on-ear headphone, the SR5 beautifully combines lightweight portability and precision design with Audio-Technica’s unrivalled sound fidelity. With powerful 45 mm high-resolution audio drivers (5 – 40,000 Hz frequency range), the ATH-SR5 On-Ear Headphones let you hear your music like never before, with all its strength and detail, while also giving you the comfort and convenience of a lightweight, portable design. Trending at $71.23eBay determines this price through a machine learned model of the product's sale prices within the last 90 days. Used only in a nonsmoking house.